The mycelium which is fruiting and producing the mushrooms at the time of a mushroom picture may be anything from a relatively new fungus growth to a much older, established fungus. A well established fungus mycelium may stretch over great areas underground or throughout the mass of a rotting stump or log. It is particularly dramatic to imagine the hidden mycelium of a fungus in a huge redwood stump or log where one sees them within the vestiges of the old growth redwood forests and within the remains of the forests left after decades of ruthless logging. In those ravaged areas, there is no shortage of massive redwood stumps and trunks large enough to nourish fungi for many generations to come. When you browse the pictures in this mushroom and fungi picture gallery, try to imagine the breadth of the fungus network which supports the mushrooms in the pictures. 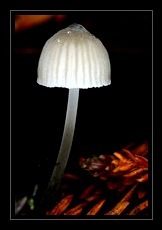 Think of it as a full fungi gallery, and not just a mushroom gallery.